John Walter Wood isn’t a name one would naturally associate with major-league motorsports. In his day, he refused to drive faster than 35 miles per hour. He worked in the coal fields during the days of the Great Depression, but his natural-born mechanical skills soon led to a career working on automobiles. His contribution to racing was through his sons, whom he taught the value of hard work and mechanical innovation. As this Father’s Day approaches, the Wood Brothers race team those sons formed 60 years ago now has won 97 races in the series now known as Sprint Cup, and their pit-road skills propelled Jimmy Clark to victory in the 1965 Indianapolis 500. The Wood Brothers race team, in the beginning, literally was a shade-tree-mechanic outfit. Their early work was done under a Beech tree on Walter Wood’s homeplace in Buffalo Ridge, Va. The Beech tree, which still stands, and the spring nearby have become part of the Wood family lore. Crystal Wood, sister to the racing Wood Brothers, said the tree stands 72 feet high, 12 feet in circumference and has a limb span of 92 feet. The spring, she recalled, offered both tasty drinking water and an excellent way to cool melons and dairy products. Glen Wood recalls how the spring water the Woods carried with them to the track in the glass jars in the early days became popular with crew members of other teams. “Pop Ergle, who was Bud Moore’s jackman, really looked forward to that water,” he said. 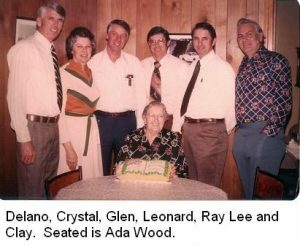 Each summer, the extended Wood family still gathers for a picnic under the tree where Walter Wood and his sons, Glen, Leonard, Delano, Ray Lee and Clay once worked on the race cars that Glen drove on the short tracks around his Virginia home. For Leonard Wood, working on cars with his father was something he’d done for most of his life. “I’d been helping him since I was seven years old,” he said, adding that even as a youngster he could torque head bolts so close to specifications that the bolts never moved when his father checked behind him. Walter Wood enjoyed working alongside his sons, but he wasn’t too amused when the boys dragged in the makings of a 1938 Ford race car. They’d paid $50 for it, which was why Glen Wood’s first cars carried the number 50. “My dad saw that car on the back of the truck and said, ‘Don’t unload that thing here,’” Leonard Wood recalled with a chuckle. But soon, father was helping sons transform it into a race car. The Woods’ first racing engine was built by a mechanic working for Curtis Turner, the racing legend who inspired the Woods early in their careers. But when it came time to change the rings and bearings and grind the valves, it was Walter Wood handling the wrenches along with Leonard. A chain was swung over a big limb on the Beech tree, and a hoist attached to raise and lower the engine from its compartment. “My father rebuilt it two times, and I did it after that,” Leonard recalled. 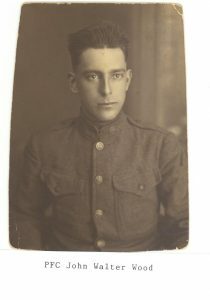 Although he helped out in the beginning, Walter Wood remained leery of his sons and their racing. “He didn’t relish the idea of what we were doing, but he didn’t work against us,” Glen recalled. Leonard Wood said his father was mostly concerned for his sons’ safety, especially when Glen was the team’s driver. “He didn’t want Glen to get hurt,” he said. Walter Wood rarely attended races, Leonard recalled. If he did go, it was to a local track like the one in Starkey, Va., and he usually went with his co-workers from the Ford dealership in Bassett. Leonard Wood said father especially enjoyed being there with his friends when his son won. Sadly, Walter Wood died 44 years ago, before his sons achieved some of their greatest NASCAR successes. Glen Wood said that while his father never attended big-time races with his sons, he followed the sport with great interest from his home in Buffalo Ridge. “He was very proud of what we were doing, even if he didn’t let us know it,” he said.